Many people are fascinated by the outdoors, they are a great open environment which gets you away from the hustle and bustle of modern life. You can be free from your phone and commitment. This makes the outdoors a great place to be wed as you can focus on each other and the memory. Here are some great wedding ideas for the outdoorsman and outdoorswoman in you. There are many great wedding locations for an outdoorsman’s wedding. Anywhere that is away from the city and large amounts of people can be a great place to get married. Being scenic provides a more romantic experience and more beautiful surroundings. One of the best locations for an outdoorsman’s wedding is a national forest or national park. 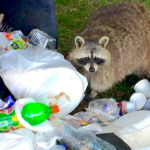 If you talk with the local park rangers or contact the national park service you can usually arrange to hold events in national parks and forests. These locations are very scenic and will usually have no running water or power. You will have to bring in all of your entertainment, food, and drink. Another location for an outdoorsman’s wedding is a log cabin. If you do not have your own cabin don’t worry. There are many websites that you can go to to rent cabins. Some state and nation park websites even offer cabins at their locations. 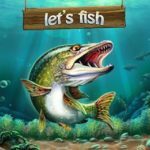 Most of these cabins are remote and you will need to plan to bring at least food and drinks to the location. Finding a person to marry you may also require a bit of work as they will have to travel. There are many different ways to add a flair of the outdoorsperson to your wedding’s decorations and accessories. 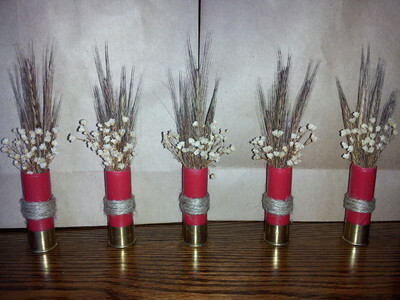 In bouquets add a pink (or appropriate color) spent shotgun shell. This will add a little bit of a flair and you will have fun spending the shells to place in them. Create a base for your cake out of antlers. This will lift your cake off the table showing it off more but it will also add an extra level of decoration to your cake. There are many websites that you can order custom cups and/or glasses. 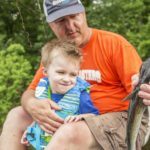 Find a customization website that you like and order glasses with designs from the outdoors such as animals, antlers, trees, and flowers. These will go well with the tables after the wedding. Bowties. Every gentleman needs a bowtie, they are a sign of elegance and sophistication. Contrary to popular belief outdoorspeople can be sophisticated too. Select bowties for the groom and his party that have an outdoor theme. Think camouflage or animal hide/leather or even an American flag. Camouflage clothing can also help add to the outdoors theme. You can have a tailor create both a tuxedo and dress out of matching camouflage so that when the bride and the groom finally come together and kiss they will blend in with each other. Are you looking to add an element of the outdoors to your wedding rings? Getting wedding rings that show an element of the outdoors will not only show your commitment to each other but a commitment to a hobby that you both enjoy. 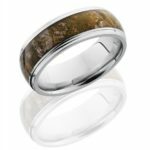 Camouflage wedding rings are a good way to show your inner outdoors person. Just don’t take it off in the woods. 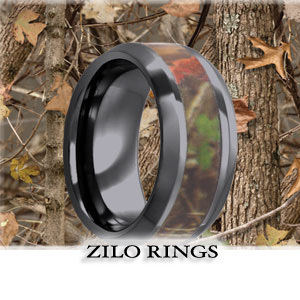 Camo wedding rings can be found on the internet and at stores. They come in a wide variety of patterns such as Real Tree or Mossy Oak. Tungsten wedding rings are also a great option because they set you aside from other wedding rings. The tungsten wedding ring is also more subdued and won’t reflect as easily when you are out in the woods hunting or camping. Have fun with your outdoorsperson wedding and don’t forget the beer! You posted some cool ideas. 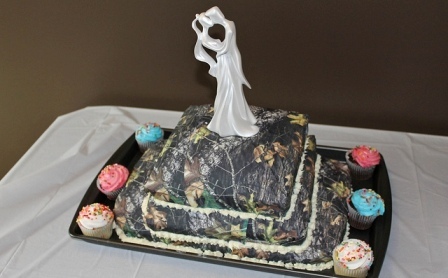 I really like the shotgun shell center pieces and camo wedding rings.